US Secretary of State Rex Tillerson said on Thursday that African countries should weigh Chinese loans carefully, while adding that Washington was not trying to keep Chinese investment away from the continent. Tillerson, a former Exxon chief executive, is seeking to bolster security alliances on a continent increasingly turning to Beijing for aid and trade. The top US diplomat may also seek to smooth relations after US President Trump reportedly dismissed some African nations as "shithole countries" in January. Trump later denied making the comment. 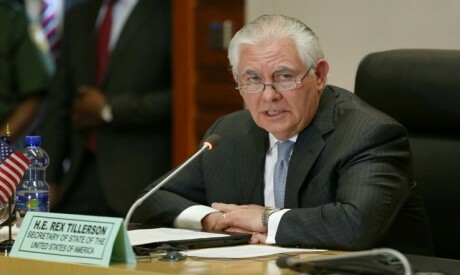 "We are not in any way attempting to keep Chinese dollars from Africa," Tillerson told a news conference in the Ethiopian capital during his first diplomatic trip to the continent. "(But) it is important that African countries carefully consider the terms of those agreements and not forfeit their sovereignty." Though the United States is the leading donor of humanitarian aid to Africa, China surpassed the US to become Africa's largest trading partner in 2009. Beijing has pumped billions into infrastructure projects, though critics say there is often little upside for local economies because Chinese firms and labour build the roads and rails. Tillerson took that line on Thursday, saying that Chinese investments "do not bring significant job creation locally" and criticised how Beijing structures loans to African government. If a government accepts a Chinese loan and "gets into trouble", he said, it can "lose control of its own infrastructure or its own resources through default." He did not give examples. Russian foreign minister Sergei Lavrov, visiting Zimbabwe on Thursday, told reporters he did not think it was appropriate for Tillerson to criticize China’s relationship with African countries. "It was not appropriate to criticise the relations of his hosts when he was a guest there with another country," he said. Tillerson arrived in Ethiopia, Africa's second most populous nation, on Wednesday and visited the African Union headquarters on Thursday. The complex was fully funded and built by China and is seen as a symbol of Beijing's thrust for influence and access to the continent's natural resources. Ethiopia is home to some of Beijing's biggest investments, from a railway to Djibouti that opened last year to factories and industrial parks. His comments followed a speech earlier this week in which he criticised "China's approach" to Africa which he said encouraged dependency through "opaque contracts" and "predatory loan practices". "We welcome Chinese participation, but we hope they will follow international rules, international norms and respect the sovereignty of countries," he said on Thursday. He made no mention of the political situation in Ethiopia. The prime minister resigned suddenly last month in what he described as a bid to smooth reforms. A state of emergency was swiftly imposed but protests in the restive Oromia region have continued. Tillerson was due to meet with Ethiopian officials on Thursday afternoon before flying to tiny Djibouti, host to sprawling military bases owned by the US, China, Japan, France, and Italy. He will then visit Kenya, a key US ally in the fight against al Shabaab Islamist militants in Somalia, before travelling to Chad and Nigeria, which are also battling to contain Islamist insurgents. Analysts say Trump has focused mainly on security concerns in Africa at a time when China, Turkey and other nations are ramping up diplomatic and business links.